While this agricultural nightmare caused great hardship in the farm community, it did give those who still wanted to work with cacao a chance to re-examine their entire operation and start again from scratch. 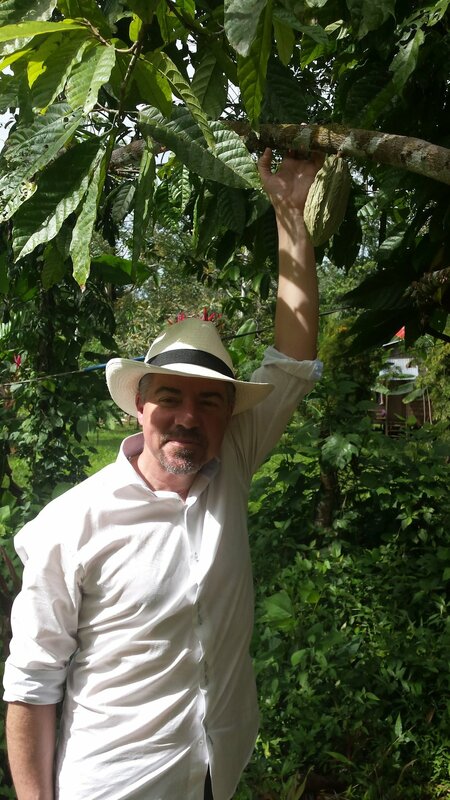 Many felt that the future of Costa Rica should be in producing high-grade flavour beans rather than cheap bulk cacao. Criollo seedlings were imported, primarily from Colombia and Venezuela, and planted in mixed rainforest settings where the trees could flourish and grow in a more natural habitat. Over the years enough quality cacao was being harvested that chocolate makers became interested in working with these beans and a number of them set up shop in Costa Rica itself – making chocolate locally from beans grown just up the road. We visited the farm of Elmir Diaz, who has about 2000 criollo trees in a dense chunk of rainforest near Cahuita National Park. Many of his trees are still very young, but he is able to harvest enough beans each year to supply three different Costa Rican chocolate makers. The jungle he works in is a riot of vegetation and wildlife. Howler monkeys scamper through the treetops, toucans and vibrant yellow euphonias flit overhead. Once we stopped to look at a particularly interesting tree and noticed that hanging just a few feet above our heads was a mamma tree sloth nursing a baby. Multi-coloured frogs and snakes abound, and the jungle floor is literally crawling with a constant stream of insects. Amidst all this noisy, steamy chaos cacao trees are dotted throughout the forest, interplanted with taller hardwoods. Vanilla orchids wind their way up the trunks while taro, squash and sugarcane are grown at ground level in sunny clearings. When we talk about “farming" cacao many people picture orderly rows of trees standing tall - like a prairie cornfield. The reality is a whole lot messier, but the end result is happy, healthy trees and better quality cacao beans. For farmers like Elmir there is still much work to be done: fermentation boxes and drying racks are often extremely primitive; fungal diseases are still a threat; and most cacao trees are years away from maturity. However, the potential of this beautiful and wild country to be a leader in the fine cacao industry is undeniably there. We look forward to many stellar Costa Rican bars on the shelves of The Chocolate Project in years to come!